It seems like it’s taken forever, but it’s finally here. I can now hold in my hand a copy of A Housefly in Autumn that doesn’t have the word PROOF stamped in bold letters across the last page. This is the real deal. The book is live. Now all I have to do is sell it. There should be a richer reward for writing, editing, formatting, and generally coordinating the production of a novel than the big prize of having to persuade people to buy it. I mean, yeah, there’s the sense of accomplishment, but writers are dreamers. They have big, glorious dreams about their work. Rarely does the dream culminate with nobody buying the book. The reality may end that way, but not the dream. So let’s not worry about reality for a minute; let’s focus on the dream. The dream is that all kinds of people, from all over, get behind the book and spread the word to other people I could never reach on my own. If you are inclined to help with this dream, I am grateful for any assistance. Whether it be through social media, word of mouth, or smoke signals, I’ll take it. I need all the help I can get spreading the word. Big Man is first in line to get his copy. Here is some information about the book. Genre: Young Adult and up. I’ve tried to create something that both young adults and adults could enjoy while attempting to do some things that are different from the current trends in YA fiction. Time will tell if different is a good thing in this instance. Synopsis: At 17, Anders Christiansen was a young man overflowing with potential. All his teachers believed he was destined to blossom into a leading man of letters, enjoying a life of rich rewards. I haven’t told you how good the book is because you should never trust the author to tell you about the quality of his product. You can trust that I’ve poured years of hard work into this book. Whether that’s enough is for the reading public to decide. Thank you for helping me reach them. This entry was posted in Random Toy Box and tagged A Housefly in Autumn, book release, books, fiction, Kindle, novels, paperback, reading. ← Where have you hidden my manhood this time? It was once only a dream for me, too. Dreams are hard work, but they can come true. Keep dreaming and working hard and you never know what can become reality. Just keep going! This book sounds very interesting. Check it out! Thanks so very much, Gibber. You rock! You’re welcome. 🙂 Wish I could do more! Do you happen to be friends with Oprah? Let me get my people to reach her. Wait…I have people? Check with Mr. Gibber. He might know. I think he’d laugh at me if I asked ha! Thank you. And thank you. I really appreciate your help and your good wishes. Btw, do you have a FB page and Twitter? Not on Twitter – haven’t mastered keeping up with everything else yet. Just bought it for my daughter. She is a voracious reader and is rapidly going through her summer stash. Awesome. Avid readers are some of my favorite people. As are those willing to take a chance on an unknown author. Thank you! My pleasure. It’ll be great to have something new for her for when she gets back from camp this Sunday. The follow up to fun times at camp – that’s a lot of pressure, but I’ll take it. You have accomplished a dream that many of us have. I am so happy for you. Congratulations! Thank you very much. Keep dreaming your dreams. That’s the first step to making them happen. Thanks very much for reblogging. The support for fellow bloggers is humbling. I always like to have my Nagele novels autographed. Where can I send a check & get an autographed copy mailed to me please? LOL Congrats! Those were some damned good feelings! that I knew you when. Thanks. I also hope it’s a big so you can tell people you knew me when. I’m really cheering for you on this one. Great plot idea, Scott. I’m off to buy it now. Thanks so much, Mark! And a reblog at your fabulous place fills me with gratitude! I’m glad to help in any little way I can, Scott. It’s important to you, it’s important to me. That’s a two-way street, Mark. Runs in both directions. Congratulations, Scott! I’m late to this party but glad to arrive 😀 I just put your book in my Amazon cart and will likely have my 16yo read it before I can get to it. We’ll be glad to give you a review once read. May I encourage you to get a twitter account even if you don’t use it? I know that sounds crazy but if you had one, I could have linked to it. It would look something like @ScottNagele . That way, your twitter friends can more easily drive traffic to you and your site via your twitter home page. The 1st link is to this post and the 2nd is to amazon. I didn’t have space for the title of the book, but can send another tweet out with the title included when you’ve posted about your book again. This is another example of if I could tweet people straight to your twitter account, I could save characters and include the title. 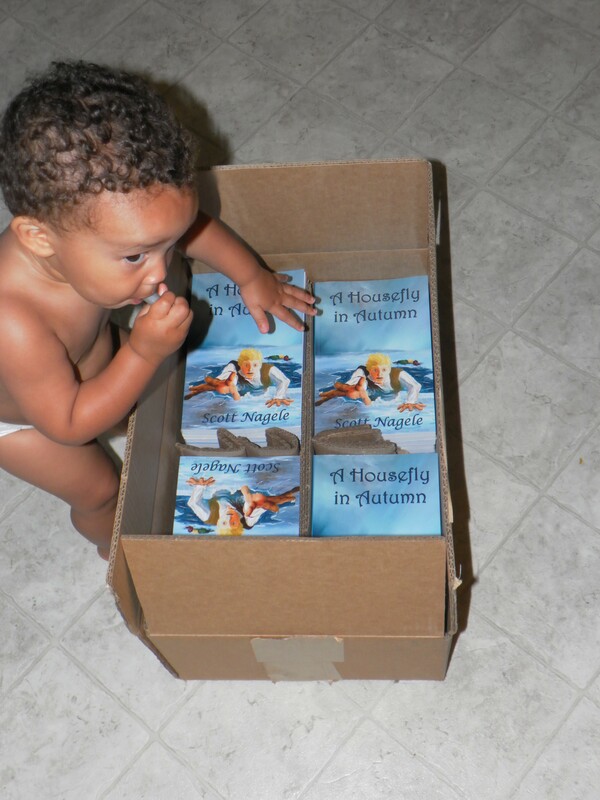 A Housefly in Autumn is a new book for fiction lovers of all ages. …is 66 characters which leaves room for you link and addition commenting or hashtags. Speaking of hashtags, I did the best I could to guess at which would fit your needs. When you are at twitter, you can look for other hashtags that fit. I’ll be glad to add them in the future. I’m not sure if you follow http://carrierubin.com/ but she does an amazing job of marketing her books via both blogging and twitter. Great example and approachable. I hope this makes a little sense and is a help! Take what you like, leave the rest, and if I can clarify or help, let me know. All the best to you and yours! Of course, you are right, Angie. I’ve been putting off Twitter because I have trouble keeping up with what I do have already. But it does no harm to have the account. I may even find time to learn how to use it some day. I will put it on my list to accomplish this week. Thank you for all of your advise and support. Scott, getting an account is a great start. Don’t underestimate that! Twitter is amazingly fluid and flexible. And forgiving. As for you on Twitter? I feel that you are unusually suited to have a killer Twitter account, if you ever want that. Your quick wit and concise wording make for a perfect match. Humor is A king on Twitter. Keep me posted!